First, we’d like to wish all our readers a happy, safe, and prosperous New Year. 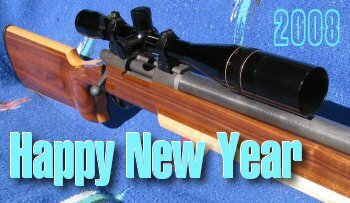 We hope that, in 2008, you’ll have time to enjoy your precision rifles, and spend more time at the range, hopefully with good friends that share your “addiction to accuracy”. As the site grows in popularity, we hope to expand the features and the content offerings on the site in 2008. You’ll see more videos, more in-depth interviews with top shooters, and more comprehensive product tests. We’re already gathering products for a chronograph “shoot-out” that should “bust” a few myths and provide rock-solid info for shooters. We plan to comparison-test front rests, and review many of the great new scopes coming out in 2008, including new offerings from March, Schmidt & Bender, and Sightron. And we’ve got new Cartridge Guides in the works. But to do all that, we need your support. In the past month a couple dozen guys have generously donated to the site. I want to again thank all those who have contributed. One staunch supporter of the site donated $750.00 yesterday. (Thanks Joe… you’re the man!) But that still leaves tens of thousands of users who use the site regularly without contributing one penny. Here’s my proposal. First, if you have used our FREE Classifieds to successfully sell your rifles or shooting gear, consider sending in a dollar or two from your sale proceeds. 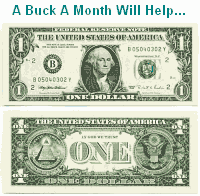 Second, for those who use the site regularly, consider donating One Dollar a Month. That’s less than the price of a cup of coffee and much less than many websites now charge for their “premium content areas”. Consider this — what do you pay for a movie ticket these days? Probably $7-8 dollars for 90 minutes of escapism. For a buck a month you can help this site provide a YEAR’s worth of info, tests, and shooting news that you won’t find anywhere else. Making a donation to the site is simple and easy. Scroll to the bottom of this page and click on the Donation Link. You don’t need a Paypal account. Any sum is welcome–donations need not be large. If 20% of our readers gave even $5.00 a year that would enable us to hire a regular staffer to do research, create videos, and do field tests. 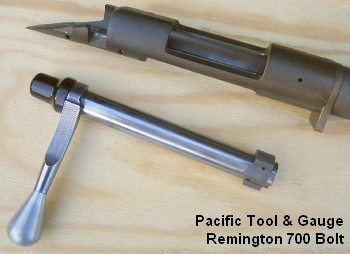 Share the post "Happy New Year and Message to Our Readers"
Dave Kiff of Pacific, Tool & Gauge (PT&G) has been making complete replacement bolts for Remington 700 actions for quite some time, but many of our readers may not be aware of this PT&G product. Why would one need a replacement bolt? First, this allows you to have different bolt-face sizes for the same action. For example, with two bolts you could shoot both a .308 Win and a 300 WSM from the same action. Second, the PT&G bolts are precision machined to the internal dimensions of your action. If you are having your Rem 700 action blue-printed (accurized) by a gunsmith, a new bolt from PT&G completes the job perfectly, and will give you a more precise-fitting bolt with less internal slop. Rem 700 replacement bolts start at about $125.00 for the bolt body only (complete bolts are also offered). PT&G bolts are available with either a standard Remington extractor or a Sako-style extractor, with .223, PPC, .308, or magnum bolt faces. The tolerances rival that of the bolts found in custom actions. You can order direct from PT&G in Oregon, (541) 826-5808, or you can purchase through vendors such as MidwayUSA.com, (bodies only, search for “PTG Bolt Body”). If you want a custom spec bolt, it’s probably best to have your gunsmith deal directly with Dave Kiff at Pacific Tool. Share the post "Rem 700 Replacement Bolts from PT&G"